This entry was posted on Friday, December 17, 2010 at 11:00 AM. You can skip to the end and leave a response. Billy ThunderKloud is a great entertainer. I've had the pleasure of seeing his show on several occasions and he is wonderful! The "get-up", as you called it, was not tacky and as you said was in the 70s. Those types of stage costumes were common in country music back then. Billy had several songs in the top 40 on the country charts back in the 70s. A great accomplishment for a full-blooded Indian from Canada. 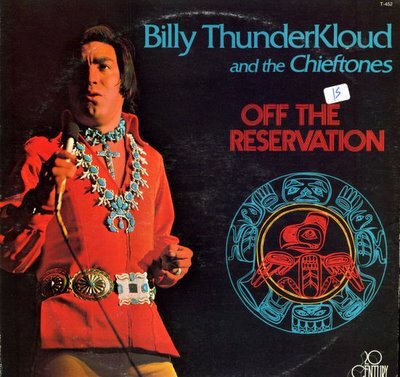 As for the Off The Reservation album you say was shamefully named, that was one of Billy ThunderKloud's first albums and he indeed was off the reservation since he was raised there before becoming an entertainer. Billy still occasionally entertains and is not a used car salesman. Just goes to show, you can't believe everything you read! Hey Judy, thanks for reading, and thanks for writing. I was skeptical myself about the car salesman thing, I'd much rather think he's still alive and doing his thing. I'd love to catch his act. Unfortunately there's very little info about him online. And I know that Nudies (and Nudie ripoffs) were all the rage in country music for many years, but I still think the get ups are tacky. And even though he was raised on a reservation, I think the album title gives the wrong impression when you see it. Kudos to him for making it, I just wish he didn't have to be a human cartoon to accomplish it. Hell, all that stuff might have been his idea for all I know. It just seems a little cheap to me. Billy ThunderKloud wasn't a human cartoon and he made it because he's a talented entertainer and puts on a great show! You can find several of his albums online. Billy ThunderKloud was indeed a remarkable entertainer. Once a person saw his state performance, they were totally sold on him. He still has one of the most remarkable voices I have ever heard. I traveled almost 20 years with the group and saw first hand how the public responded to him. Standing ovations at almost every show, sometimes as many as six at one show. I was President of his Fan Club, Northeast Manager Booking Manager until 1988 when the group disolved. Billy, Barry and Jack are all still alive and doing well. Unfortunately, Richard Douse passed away very suddenly few years ago at a very early age. This group was very highly respected across the USA, Canada and in Europe. Billy was presented a mountain lion my Walt Disney personally. He also performed at President Nixon's Innagural Ball. Just a couple of highlights of his remarkable entertaining experience. There are many wonderful performers in this world but Billy was definately a tremendous performer. You should take the time to listen to a couple of cuts from one of his albums if you have one. He truly was one of the best. He was loved and respected by some of the biggest entertainers in the country. Billy ThunderKloud is indeed a fine entertainer. He and the band lived neighbors to us when they first came to the states to live and play. He was respected by all and showed much pride in his Indian heritage. He and the boys also pitched in and helped the neighbors in the area with haying and other farm chores. They also would stop and play ball with the 4H kids. He is a hereditary Indian Chief even though brother Barry is older. I do know his real name but since you don't I guess I will not tell either. Their outfits were great for the era. As stated by another poster that was the going thing in the 70's. I don't know where he is now but I would love to hear them sing again. He and Richard married women from the neighborhood. I take offense to your comments as I know this whole community would. Too bad you couldn't have seen one of their shows. You may have a change of heart. I don't think I ever disparaged him as an entertainer. Just as you note that I haven't ever been wowed by Billy on stage, I also know you're not a reader of this blog. Many times these posts are face value observations, with no real link to the atmosphere or reality of what spawned the artist or their music. One thing you'd undoubtedly pick up on is that we are smart asses, and you shouldn't take us seriously. You've obviously got your memories of how it was, and I've got my perceptions based on finding this album many years later. It's telling that what little I wrote would offend you, when you are defending trappings and nicknames that would make most people shake their head, simply based on the fact that you liked the arist. That he was a great entertainer, and nice citizen, doesn't change the fact that people might find the whole thing a little exploitative now. Someone can tell the story, the real story, later. Billy was a friend of mine. I am native american from Mississippi. I was inspired to be a great entertainer as he was; and I have become a great entertainer! Although, I have changed my musical genre to Gospel... I get standing ovations as billy did. who ever puts billy down puts down native Americans all over the country. He is one who uses Native American mascots for their ball teams. What about the Detroit Negroes vs. The Texas Rednecks! That would do justice for us!Billy used to be the Entertainer's entertainer. He was not "cheesy" he was claSSY. Go and educate yourself! Yeah, that's real classy. And I never even used the word "cheesy" in the article or comments. But thanks for reading so carefully. And thanks for also assuming that I am not Native American, when you have no idea. Once again, these are my opinions. I believe the man can sing. I believe the people who've commented and say he was a great entertainer. I also believe the outfits, his band name, and album title are exploitative. You can disagree. His quality as an entertainer does not affect my opinion about those things, though it obviously does for other people. What I do see is people who've never followed this site landing here from a web search, barely reading what I wrote, taking out the portions they construe as negative and then commenting condescendingly, as if it's impossible to find some parts of his shtick offensive. I was complimentary about the parts I thought were good. I do know that the reaction of every one I've ever shown that album cover to is usually, "What the...! ", conveying a small measure of shock. I was the bass player for Billy in 76-77. It was 1st class all the way and one of the better paying rd. gigs at the time, and yes we had to dress up too. That was the style back then.Had a 1st class showbus with a driver and got to go and see places I could never do on my own.Billy was a class act and a friend. Wish you could have seen our show. Hank Butler Atl.Ga. I met Billy in 1973 at a fair in Kentucky. His voice was the greatest I have ever heard, and I saw Elvis several times. They did not ever exploit their Indian heritage. The last concert I attended was in 1984, and I have missed seeing the guys so much over the years. They were wonderful people, and I miss them. When Richard died I was heartbroken. There were 4 of us "girls" who liked to travel together to see the performances. One of the group died on New Year's Eve. I hope she is in heaven with Richard. You would call us groupies, but we knew the difference because we really were great friends. Back in 1975 I heard the record What Time Of Day, on the radio and took off to the record store to get a copy. They didn't have it. Later I found the album in question and bought it. The reason I wanted it was because I thought it was Dale Ward. Dale had a several records out back in the 60s. Do you remember A Letter From Sherry? I swear I thought I was listening to Dale Ward. I started a fan club for Dale in Nashville back in 1964. Noel Ball was promoting or producing him from W-MAK. Sorry if I got off topic. There was nothing wrong with Billy's outfits. Noting wrong with his show name either. Did you ever see Porter Wagoner and The Wagon Masters? How about Conway Twitty and the Twitty Birds? His real name was Harold Jinkins by the way. Billy has a great voice! Billy was a great person and performer. I sure would like to see him and talk to him again. I sat many an hour and we would talk about alot of things. I sure would like to find out how he and the guys are doing today. I hope sometime he will sing again because he had a great voice. He really cared about people. Billy had many parts to him he is a great person. Billy and the Chieftones were great. I had the pleasure to see many of their shows from 1974-1976 (many of them were at the Allentown Fair), and then I saw one show in 1982, but that one was just Billy & no Chieftones:( I was a kid with a HUGE crush on Barry:) I liked their music and their costumes. I will treasure the photos that I took back then. Sure would love to know what they are up to now. I had no idea that Richard has passed away until I was reading this page. I grew up knowing Billy, and he was a second dad to me whenever we were on the road with him and the band-members. The whole Band was like my big brothers, and they ALL seemed to look out after me when we traveled together. Along the way in our travels, I was taught how to connect the cables up to the sound board, as well as setting up most of the equipment, unloading the trailer and repacking so the equipment would all fit inside after the shows. I loved that life, and I have to say I miss it. I used to love to go and hear Billy sing. I respected all of the band members, and miss seeing them on a regular basis. I remember so many fun times. Billy held each one of my babies when they were small too. Now they have all grown up. But they did not get the opportunity to know him or the group of wonderful musicians and the BIG CAT Simaugit like I did. I would love to have the opportunity to talk with anyone of the group again that might remember me. I am Kim or othwise known as Ruth and Sonny's daughter. My mother was President of his Fan Club, Northeast Manager Booking Manager until 1988 when the group disolved. And I cried when they disolved. Billy did some singing on his own, but it was never the same. I will always treasure the photos that I had taken back then. As well as the ones I got from my mother before she moved. I sure would like to see him or anyone from the band for that matter and talk to them again. I sat many time with Billy or Barry, or Richard and we would talk about alot of things while on the road. I have almost every album, and some very special tapes of the shows he did up here in the North East. Message me on Yahoo IM at luchs32 or e-mail me at luchs32@yahoo.com if you were a part of the band and remember me. Hey, I have seen Billy perform many times and he was wonderful. (I too know his real name - but not telling). His picture is on my computer screen - see him everyday. Would love to know what he is doing and how he is. I do know that Albert wrote and book and will be out soon. Oops I guess I should really proof read my comments. I used to see him almost every year at the MN State Fair. I've tried for several years, unsucessfully, to find some CDs of them. My folks had an album, that I'd would love to get a copy of. Not sure of the name, but it was blue and had Indian Nation, Beautiful Sunday, and How Great Thou Art on it. Google Billy ThunderKloud and you'll find quite a few sites that sell his albums and there are a couple that have copied them to CDs. Thanks to all of you who have jumped in and praised Billy ThunderKloud. Times now are so different than they were back then. Back then it was about performance, pride and appearance. Now, if you think you have talent, you can get up on many stages in ratty jeans and greasy hair, to say the least - we all have even seen this on the Grand Ole Opry stage. It is a culture change and a lot of it we do not like, especially after being used to such class. Obviously, this person was not brought up in an era that class still existed. He really needs to get a life and stop putting down those he knows nothing about. Actually, he should be ashamed of himself. There are still plently of those people out there that would still run the Indian of the reservation if they could - he can only dream about it. We have all had the pleasure and memories of Billy - this guy just doesn't get it!! You should pay attention to what was actually written, and the responses I've made to other angry, well-intentioned people who can't get around the fact that I found the outfits tacky and exploitative and a bit offensive. That's my opinion and all the knee-jerk Internet caterwauling in the world won't change it. You should be ashamed of all the assumptions you've made here, especially the bit about the reservation. I doubt that they are assumptions. You give yourself away in your first paragraph. It speaks millions for your profiling of others. Like I said before, get a life and stop critising others just because it may not be "your style". You may not even have a style. Does that make you a little jealous of all the attention Billy got for over 20 years? Like I said - you are a wantobe looking to express an opinion that no one really gives a hoot about, but others will defend reality, weather you like it or not. Give it up!! Wow, what? You think I took the time to listen to this record, scan the cover, and write about it because I am jealous? Let me give you some background about this blog: we take old lost and forgotten vinyl records and write about them. Much of the time there's no available information about an artist, so we have to talk about the cover or the lyrics, or tell a little story. We have a definite tongue-in-cheek style, and we imagine that most people reading would recognize that. However, in many cases we are the only place an artist is written about on the Internet, so people end up finding us when they do searches. A few of our posts have become sort of de facto message boards for people who were fans of artists we've written about. That's fine, and it's great for people to reminisce about that stuff, and we end up learning more about the artist in the process. We did this blog because we love music, all kinds, and we often run across some things that surprise us or make us laugh. I'm not going to apologize for how we go about things, and I could care less about your assumptions. I thought maybe you were a reasonable person, that's why I responded to your comments. Did you ever consider I might be Native American? Maybe I come from a place where I've seen them treated poorly? Of course not, you have your mind made up already. Since I wrote this article a few years ago, I've picked up a few more of Billy's albums. All because I am jealous of him and hate the music, you think? I would like to forwrd an attachment to you to review and you may post it if you wish after you review it. Please let me know how I do this please. I have forwarded an attachment to you and I hope that you can attach it ti this site to share with everyone. It would be a wonderful treat. Have a fabulous Holiday Season. Ruth, please send it to therecordrobot@gmail.com and I will endeavor to share it here. Thank you so very much for posting - you are awesome for doing this!! I hope that lots of fans will stop back in and see it, especially around the Holidays. Best to you and yours. Merry Christmas. See the crap you can start just by saying a few words. I'm native (much younger than most commenters here) I really don't see anything wrong with what you wrote. People take things way too personally. It would really be interesting to see what Billy thought of those outfits he had to wear. I'm sure they were not all worn by choice, but by what the record company thought would be bring in the money. You have to admit...compared to today's fashion...it's a bit over the top..but that's the 70's for ya. When I saw the cover...immediately thought of Elvis. Even his hair is some what like his at that time. If memory serves correctly...Elvis was Native American as well. Thank you so very much for posting - you are awesome for doing this!! We did this blog because we love music, all kinds, and we often run across some things that surprise us or make. Thank you very much. I have been searching for it for a long time. Billy is not dead and he hasn't talked to Barry in over 30 years!! Billy is not dead and I, too, can confirm he and Barry have not spoken in over 30 years...for very good reasons. With this said, Barry has no clue about anything involving Billy. Unless the poster of November 22 is Kevin (who was once Barry's stepson) I cannot imagine who may have posted this erroneous information. The last anyone checked Barry was still unmarried although by now he might be considered in a common law marriage. I also would be more than pleased to say that Billy, Barry and Jack are alive and doing well. Unfortunately, Richard GrayOwl passed away several years ago, leaving a wife and two boys. Everyone should say a prayer this Holiday Season for the family he left behind. He was also an awesome entertainer and is greatly missed. Rest In Peace, Richard. Ha! I can't help but laugh at all the misinformation on the internet about Billy ThunderKloud. I personally know more about him and the band than anyone one else alive. I was married to Billy for twenty years and boy could I give the world an earful. But I'll save it for my book. Richard, by the way, died of liver cancer, his boys were grown and his wife "Terry" had long since left him for another man. I remember seeing Billy and the Chieftones play in Minnesota when I was quite small. It was an awesome performance and I never forgot it! I recently found a signed album cover by Billy, Barry, Jack and Richard from their "Where Do I Begin To Tell The Story" album which, by the way, contains the songs Beautiful Sunday, Indian Nation and How Great Thou Art (for the post on Nov. 2010). I had to buy a record player so I could listen to it. They're getting hard to find! I was excited to see them in costume as it made the whole Indian culture real for me. I would later in life meet Chief Archie Mosey from the Turtle Lake Band of Ojibwa (in full head dress) and must say it brought me back to the awe-struck days of listening to Billy. Chief Archie has since passed away and I think of Billy and his band every time I see one of Chief Archie's grandchildren. 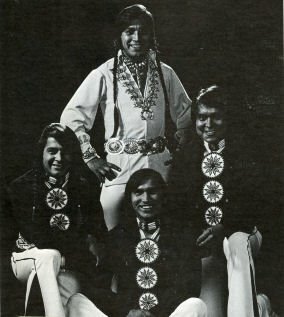 I have much respect for the accomplishments, especially in the music industry, for any member of the Indian race and am thankful for the chance opportunity to listen to them so many years ago! I appreciate the fact that they were not embarrassed to embrace their culture and made me proud to find my own Indian roots and that of my husband's (Cherokee, by the way). Have any of you diehard fans thought about making a Wikipedia page for Billy and his band? It seems a little unfair that our now-dormant blog is the only source of information on this, especially as we are an entertainment site and not to be taken very seriously most of the time. This mix is perfect for a dj mix tape that I'm putting together. Please let me know when you have new stuff out. I'll definitely play it. Hey thanks for sending me down memory lane...PS.... no negative comments here! lol Some people are so mean. Billy inspired a great deal of love and loyalty. He spoke to a group of Campfire Girls for me who were studying Native American History and was always happy to give of himself. I am sorry Susan has unhappy memories and would love to read her book but he was always a gentleman to me and had a voice that can not be beaten by anyone.I feel priviliged to have known him and had him visit my home. LOL Just had an amusing memory that you all might like. My then 5 year old daughter had heer first crush on Barry and he would carrry her around. Guess he was more her size but she still remembers him. I saw them in Nashville a long time ago and bought their album which I lost. Can anyone tell where I can get a CD. Google Billy ThunderKloud. There are several sites with CDs. Billy was a great person and performer. CAN ANYONE TELL ME HOW TO CONTACT BILLY??? i HAVE WONDERED ABOUT HIM FOR YEARS, SINCE I WAS VERY YOUNG. WE MET HIM AT THE DALLAS BOAT SHOW AND I HAVE NEVER FORGOTTEN HIM. I STILL HAVE MY ALBUM. IF ANYONE HAS ANY CONTACT INFO, PLEASE CONTACT ME AT SJFAULK@AOL.COM. Billy ThunderKloud passed away on June 5, 2018 from complications from a stroke/pneumonia at his home in Palm City, FL. Born Vincent Clifford on May 7, 1948 in the village of Kispiox in British Columbia and raised in the village of Kitwanga. Billy was a hereditary frog clan chief, belonging to the Gitksan tribe. His Chieftainship name was Chief Dau-Hkansqu. At age 14, he hopped a train from Port Edward, BC to the Indian Residential School in Edmonton, Alberta. As part of a school experiment, Billy was selected from 120 students, along with three other students, to form a musical group. The group was formed to familiarize the non-Indian with the young Indian of today. Billy and the band began touring the US in 1964 as The Chieftones, with Billy (Vince), as the lead singer. In 1965, they released their first two singles “Rang Dang Doo” and “Mona Lisa.” During the next three years, they released five singles for the Claremont, Cuca and Youngstown labels, and were represented by the William Morris Agency. Their song "I Shouldn't Have Did What I Done" is featured on the 2014 compilation album Native North America, Vol. 1. In 1972, Billy adopted the stage name Billy ThunderKloud and the group was billed as Billy ThunderKloud and the Chieftones, signing a recording contract with Superior Records, owned by Duane Allen of the Oak Ridge Boys. Two albums were released on Superior Records. In 1974, Billy signed a recording contract with 20th Century Records and moved to Nashville. Billy and the Chieftones signed with Buddy Lee Attractions in October 1974 for exclusive bookings, and in 1975 added five musicians to the band. After 20th Century closed its record label, Billy signed with Polydor Records. Hit recordings include What Time of Day (20th Century), Pledging My Love (20th Century), Indian Nation (Polydor), Try a Little Tenderness (Polydor), and It's Alright (Polydor). The single What Time of Day not only reached #16 on the country charts but #32 on the AC charts and #92 on the pop charts. One of Billy's greatest achievements was when he was chosen Outstanding Indian of the Year in 1975. Billy and the Chieftones performed at President Nixon's second Inaugural Ball. Billy was a Kentucky Colonel and was also named an honorary Shriner. Billy continued touring until 1991. Billy was retired and living in Palm City, FL at the time of his death. He's survived by his wife, Bev, daughters Shawnee (Nick), Chey Kuzma (Sam), and three grandchildren. At Billy's request, there will not be a service. If you would like, you may make a donation in memory of Billy to National Indian Child Welfare Association, Shriners Hospital for Children, St. Jude's Children's Hospital, American Diabetes Association, or a charity of your choice.